Queens native Rachel Platten has one thing to say to those facing adversity: Fight. 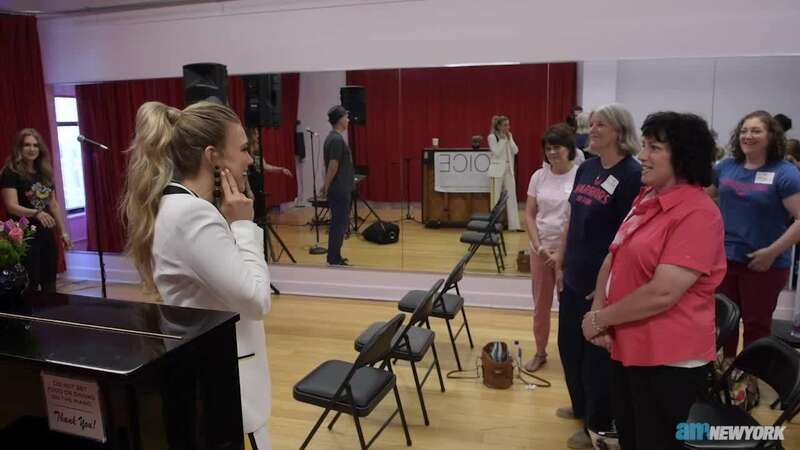 The singer, whose breakthrough hit “Fight Song” topped Billboard charts and became the unofficial anthem of the 2016 Democratic National Convention, surprised eight breast cancer survivors with private singing lessons in midtown Wednesday afternoon. Embracing everyone with open arms and a smile that hardly ever wavered, Platten used her talent to encourage positivity and self-acceptance among a small group of strangers. Singing may come naturally to the 36-year-old, who released her latest single “Broken Glass” in August, but teaching proved to be a bit more of a humbling challenge. “I don’t know if I was a good teacher or not, but I really gave it my all,” she added, laughing. Platten led the group in song through verses of Bob Marley’s “Everything’s Gonna Be Alright,” Khalid’s “Location” and “Broken Glass” and let them in on some of her biggest onstage secrets — like using “helper breaths” to get through a long chorus and her “diva-ish” request for room-temperature water to soothe her vocal cords. The group was told they’d be getting voice lessons from the folks at Voice Academy NYC to boost their confidence and lower anxiety. They entered via an online submission form and were selected based on undisclosed criteria a spokeswoman described as “personal of nature” to their unique medical histories. “They were asking for breast cancer survivors to get together and do these sorts of events," said Diana Kouras, 45, from North Brunswick, New Jersey. "I’m just a year out of my chemo, so I kind of waited a little while before I got involved in the breast cancer community and I figured this is the right step and I need to move forward and start doing things." Kouras and the rest of the group started the two-hour lesson filled with nerves, their arms shaking to hold printed lyric sheets. But a dancing, energetic Platten helped them shake the stress away and muster enough courage to stand in front of the room and sing one by one. The afternoon’s open-mic style wrapup reminded Platten of her pre-record deal days that were spent bar-hopping around Manhattan in search of an audience. “I used to do three hours of cover songs at Prohibition on the Upper West Side; I used to play two hours of covers at Slane; I was in a Prince and the Sly and the Family Stone cover band that played 1 a.m. to 4 a.m. in the Village at The Bitter End and the Red Line. Those were like my haunts. I was singing in the city for 10 years, so I pretty much hit them all," she said, calling NYC her own music school. Reminding the singers of her early days and cheering each of them on, Platten hoped to leave them with a newfound feeling of self-love. “What I wanted to get across was, it’s not really about how skillful you are as a singer or how much talent you have. It’s about how much love you have to give the audience and how much joy you have to spread, so I hope that’s what they take away. They’re perfect as they are. They don’t have to compare themselves to anyone else. It’s kind of a lesson for me too,” she added. Platten's "Broken Glass," the first single off her upcoming album, is well on its way to becoming another anthem -- this time for breast cancer awareness. ("Baby I'll survive, 'cause you know I am a fighter ... I'm a survivor," Platten sings.) So, where does she find the strength to sing of perseverance? Here's a look at Platten's singing lesson surprise. The class spent 15 minutes doing vocal exercises with Voice Academy NYC teachers before Rachel Platten came in and surprised them. Platten's teaching methods involved loosening the jaw and singing with only vowel sounds to find the melody before adding in lyrics. She taught them breathing techniques, what it meant to "sing like there's an orange in your mouth" and how to match the pitch of a song. Breast cancer patient Zenia Paul surprised the group with her emotional solo. It was somewhat like "American Idol," minus the harsh judging. Platten offered spirited advice and tips to each of the singers. Cancer patient Lori-Ann Urbanski, center, and the rest of the group tried singing without taking any breaths -- which, yes, was as hard as it sounds. Platten said she was so surprised by the talent and confidence in the room. Platten's top tip: "Always smile. It makes the tone sound brighter." After class, Platten took selfies with Diana Kouras and the other new singers. Here's a look at the whole group.